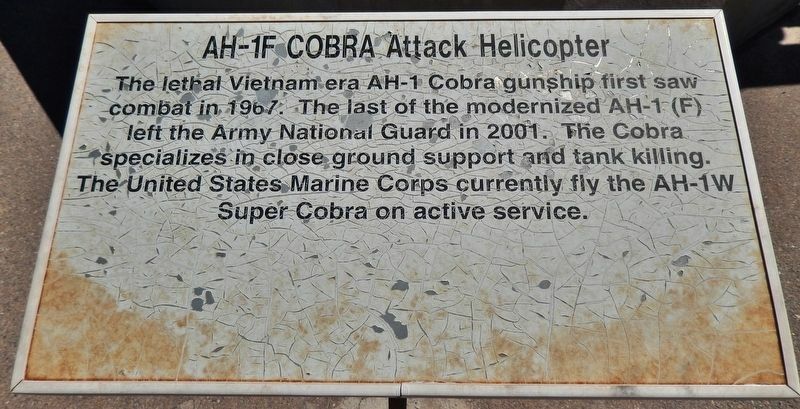 The lethal Vietnam era AH-1 Cobra gunship first saw combat in 1967. The last of the modernized AH-1 (F) left the Army National Guard in 2001. The Cobra specializes in close ground support and tank killing. The United States Marine Corps currently fly the AH-1W Super Cobra on active service. Location. 31° 49.31′ N, 106° 25.773′ W. Marker is in Fort Bliss, Texas, in El Paso County. Marker is on Marshall Road 0.7 miles north of Cassidy Road, on the right when traveling north. Touch for map. 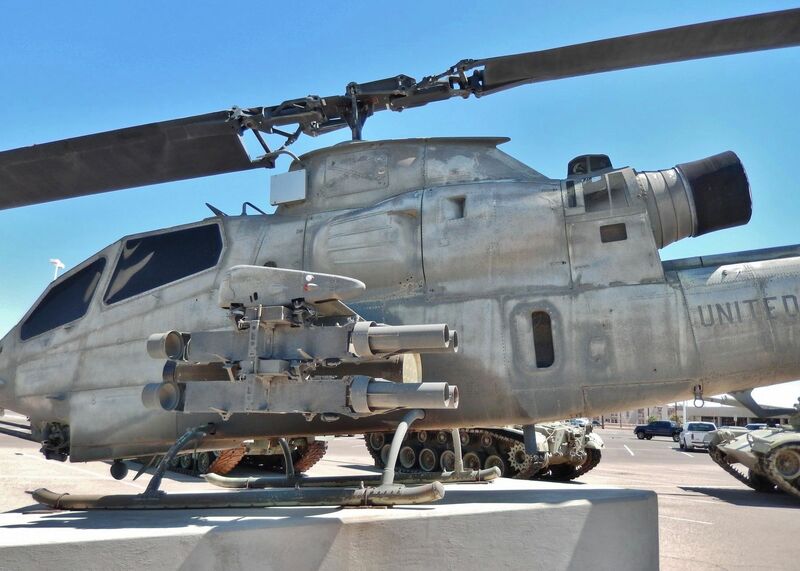 Marker and subject helicopter are located on Fort Bliss Army Base, within the large military equipment exhibit directly in front of the Fort Bliss & Old Ironsides Museum entrance. 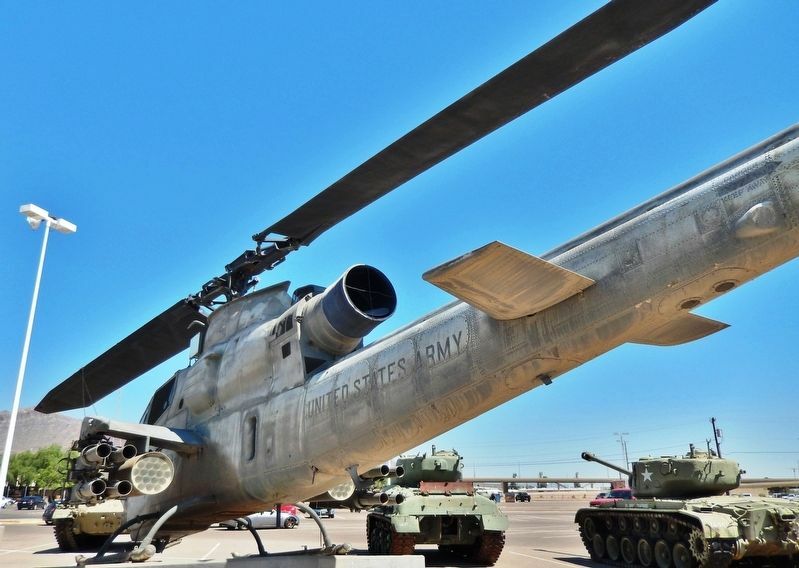 The exhibit and museum are generally open to the public during normal business hours, after gaining clearance and access through the Fort Bliss main gate. Marker is at or near this postal address: 1735 Marshall Road, El Paso TX 79906, United States of America. Touch for directions. (about 300 feet away, measured in a direct line); Pearl Harbor Memorial (approx. 0.4 miles away); Building 1372 (approx. half a mile away); Building 1355 (approx. half a mile away); Second Expansion Period Group (approx. 0.6 miles away); Historical Building 241 - The Guardhouse, 1893 (approx. 0.9 miles away). Touch for a list and map of all markers in Fort Bliss. More about this marker. Marker is a painted and somewhat weathered metal plaque, mounted horizontally on a waist-high post. More. 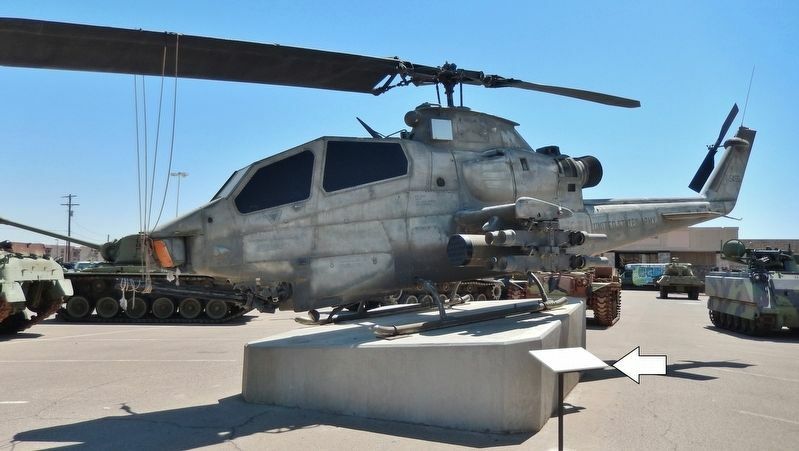 Search the internet for AH-1F COBRA Attack Helicopter. Credits. This page was last revised on March 1, 2019. This page originally submitted on March 1, 2019, by Cosmos Mariner of Cape Canaveral, Florida. This page has been viewed 41 times since then. Photos: 1, 2, 3, 4. submitted on March 1, 2019, by Cosmos Mariner of Cape Canaveral, Florida. • Andrew Ruppenstein was the editor who published this page.